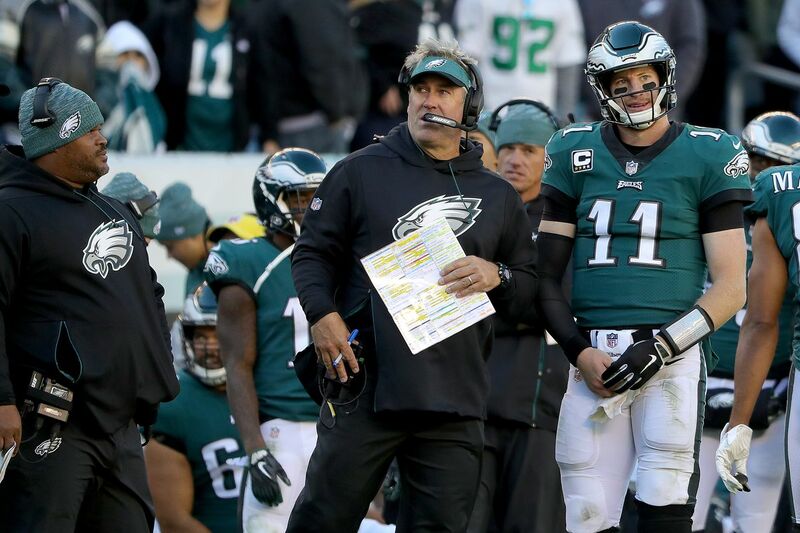 Eagles coach Doug Pederson says his team could be 5-2 at this point instead of 3-4. Good morning. The Eagles return to the NovaCare Complex today to start preparing for their Week 8 game against the Jacksonville Jaguars in London. Defensive coordinator Jim Schwartz and offensive coordinator Mike Groh have news conferences beginning at 2:15 p.m.
Eagles head coach Doug Pederson against the Carolina Panthers on Sunday. The Eagles are 3-4. They could be 5-2. They could also be 1-6. The Eagles are 3-4, but in Doug Pederson's mind, they are not far off from being 5-2. The conversation in Philadelphia would be different right now if they were 5-2. "We lost the Tennessee game fourth-and-15. We lost yesterday, you could say the fourth-and-10 play. You could almost say the last couple plays of the game," Pederson said Monday. "It's coming down to two, three plays and we're sitting here at 5-2, instead of 3-4. We're only talking about a couple of plays and this thing is different. We're talking a whole another deal." Pederson wasn't saying they should be 5-2. He was saying how close they are to 5-2. The problem with that argument, of course, is that the Eagles are also two plays away from 1-6. Atlanta's Matt Ryan and Indianapolis' Andrew Luck both had chances to win the game at the goal line. The Eagles defense made stops. That's the reality of the NFL. It's rare for the Eagles to have a stretch like they did last season in which they dominate opponents. Most games are close. Look at Pederson's first season. The Eagles finished 7-9, but they were undone by close games. A few more plays go in their direction, and they win 10 or 11 games and Pederson is a coach of the year candidate. They're judged on their record, and the Eagles aren't doing enough to close out games this year. Unless that changes, their 2018 season will look like their 2016 season. Let’s start with two newcomers in the starting lineup. Dexter McDougle was unemployed when Week 7 started. By Sunday, he played 81 percent of the defensive snaps as the slot cornerback. And Treyvon Hester, who was on the practice squad at the beginning of the month, started at defensive tackle and played 58 percent of the snaps. That wasn’t part of the Eagles' defensive plan when the season opened. Brandon Graham took the most snaps among the defensive ends, playing 66 percent. The Eagles barely played base defense. Kamu Grugier-Hill took only 15 percent of the defensive snaps. On offense, Wendell Smallwood continues to get the most work at running back, playing 52 percent of the offensive snaps. Corey Clement played 37 percent of the snaps and Josh Adams got more work than last week, playing 12 percent of the snaps. The Eagles continued playing a lot of two-tight end sets, with Dallas Goedert taking 55 percent of the offensive snaps. Jordan Matthews, the No. 3 wide receiver, played 43 percent of the offensive snaps. The Dallas Cowboys traded a first-round pick to the Oakland Raiders for wide receiver Amari Cooper, a blockbuster deal that gives the Cowboys the No. 1 wide receiver they've lacked. It was a steep price – the NFL Network reported that the Eagles offered a second-round pick – and it was especially steep given that Cooper will soon require a new contract. But Cooper is nonetheless an intriguing talent. He was the No. 4 overall pick in the 2015 draft and topped 1,000 receiving yards in his first two seasons before struggling the past season and a half. He's still only 24, so if he stays in Dallas, he's someone the Eagles must contend with for years to come. Cooper had a 63-yard touchdown against the Eagles in Week 16 last season. Eagles tight end Dallas Goedert shakes off Panthers defender Mike Adams in the first quarter. Doug Pederson's message is similar to last year, even if it's not entirely accurate. Pederson is trying to galvanize the team behind that message. In Les Bowen's game-review package, he looks at how the defense folded in the fourth quarter. Marcus Hayes writes about how Pederson says those who question his decisions from the press box don't understand what it's like on the sideline. What did Jeff McLane learn in Week 7? Paul Domowitch offers five reasons the Eagles lost. Listen to the latest Birds' Eye View podcast. McLane and I talked the Eagles' loss, Pederson's decisions, and more. When do the eagles leave for England? They need to get out of here to regroup quickly. The Eagles leave for London on Thursday. They’re keeping their schedule in Philadelphia the same until then, for the most part. The Wednesday schedule is the same, with practice at 1 p.m. On Thursday, the Eagles practice 30 minutes earlier than usual and then fly to London on Thursday evening. They arrive in London on Friday and will pick up local time in London, with practice at 2:30 p.m. local time. That’s 9:30 a.m. in Philadelphia. So the Friday schedule is different, but they’ll use that day to adjust to the time change. They’ll fly back after Sunday’s game.